Though they are unlikely to challenge for a single Assembly seat, one of the most interesting tussles of the election is that between Northern Ireland members of the Labour Party and their London leadership. 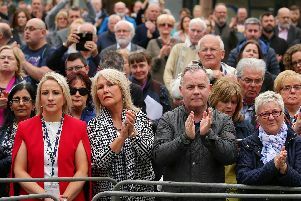 Decades of pent-up frustration at Labour’s ban on candidates in the Province meant that the promise of yet another London ‘review’ of the situation was insufficient to placate what is a burgeoning Northern Ireland branch. The last-minute registration of the Northern Ireland Labour Representation Committee (NILRC) has seen it stand eight candidates, publish an articulate – and in Northern Ireland terms, fairly radical – manifesto and openly defy a ban which Labour has never been fully able to explain. For years, there has been a clamour for Labour to stand here and now is the moment of truth: Will those people vote for Labour members? Despite that potential, the party’s decision to stand has come catastrophically late and it is swimming in a sea which is now teeming with various left wing candidates, the most established of which is the Green Party. The politically aware taxi driver who took me to the Labour manifesto launch yesterday thought (not unreasonably) that the Labour rebels were standing as ‘Labour Alternative’ – a completely different group standing in a handful of seats. With just a week to polling day, there is little time for many voters to even know that the NILRC is standing. The danger for the new party is that if those factors contribute to it receiving a paltry vote then it would be just the ammunition which the national leadership needs to dismiss the rebels as electorally insignificant. From London’s perspective, the risk of losing three SDLP votes in the Commons is not worth the very slight chance that Labour could itself seize even one of those seats. It is clear that Labour’s leadership is not remotely committed to standing candidates here. The best that local activists can probably hope for is that – as in the parable of the widow and the unjust judge – the Labour leadership is so worn down by their incessant demand to stand that it grudgingly relents.